Is Your Fluid Custom Action Menu Page-based or Component-based? In the upper right corner of the Fluid header you will find the "Hamburger" (or hamburger-light) menu. This 3-bar (or 3-dot) icon displays a list of component-specific actions. 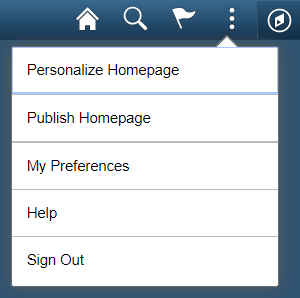 For the most part these actions are rather generic, allowing a user to add a tile to a homepage or view preferences. Occassionaly we see a component that has its own custom actions. 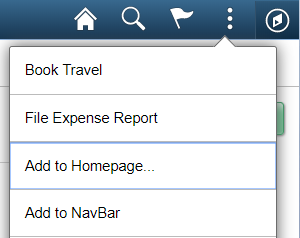 The HCM My Team and Company Directory components are great examples of components with custom action menu items. In fact, the Fluid homepage itself is an example, with its Personalize Homepage custom action. Actions inserted into the header menu have component scope, not page scope, but are defined at the page level. Custom action menu items are not visible (in fact, don't exist) until the page defining these menu items is loaded into the user's browser. If a component may have multiple pages, into which page would you insert the custom action menu? Logically, I might say, "The first page, of course." But here is the problem: there really is no "first page." There is a page that the component will load by default. We might call that the front door. PeopleSoft, however, lets users enter through the side door, back door, and all windows as well. By adding ?Page=... to a component URL, I can enter that component from any page within the component. For example, if I want to open the User Profile component to the User Queries page, I add PAGE=USER_QUERY to the end of the URL. If I enter a component through the wrong starting page, then I won't see the component's custom actions in my header menu. You don't think your users will enter a page name in the URL? Probably not. Why worry about a scenario that will never happen? Actually, it isn't my users that concern me. It is system generated messages and processes with URLs. It is workflow notifications that attempt to simplify workflow by taking me to the next step in a business process. If a user can enter a component through any page and component specific actions must be defined on a page, then into which page should I enter component-specific actions? While teaching a Fluid class and challenging students to find a solution to this problem, one of my students asked me, "What if you put the menu definition in a Footer page?" Wow! What a great idea! If you have component-scoped actions, why not define them in a component-scoped page? This page will load as soon as the component loads, regardless of the entry point. If you already have a footer page in your component, perfect! Just add the Custom Action Menu group box to your existing footer page. If you don't have a footer page, should you add one? I say, "Yes." 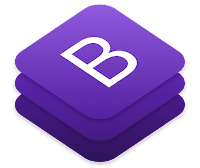 Properly built, a footer page may be entirely invisible, used just for component-specific banner (also known as the header) changes (including Custom header left, right, and bottom sections). Seems ironic doesn't it? If you want to change the header, add content to the footer. Here is a sample footer page built specifically to hold a menu. By clearing the CSS class name from the outer container Group Box, the footer becomes invisible. The following screenshot shows how the menu will appear when PeopleSoft reparents the menu's HTML from the footer into the header component action menu. Interested in learning more about Fluid? I offer at least one virtual Fluid training class per month. You can learn more about our current offerings on our Live Virtual Training page. If your organization has more than 8 employees, you may derive cost savings by hosting your own training event. Learn more at www.jsmpros.com/training. As you would expect, PeopleSoft's HCM self-service functionality allows employees to self-report many industry-generic, best-practice attributes. But none of us are industry-generic, which means we may have to capture more attributes than Oracle intended. The way I've seen many organizations handle this is to customize the delivered Personal Details pages to collect additional attributes. Although having an upgrade impact, customizing the classic versions of these pages makes a lot of sense. With continuous delivery, however, customers no longer apply massive upgrades, but rather iterative, incremental continuous upates. With this in mind, the cost of maintaining a customization is significantly higher than the traditional periodic upgrade model. A customization may be the only thing standing between you and important new features. Wouldn't it be nice to revert your personal details pages to vanilla? 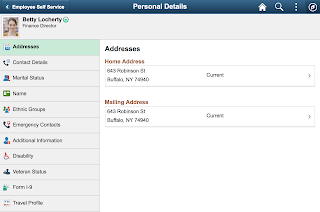 Classic HCM housed several components that collectively represent "Personal Details." The Fluid iteration of Personal Details uses a design pattern akin to a WorkCenter to colocate the navigation for each of the Personal Details components. Rather than customize delivered components, what if we took any custom attributes and placed them in a separate component and then added that separate component to the list of Personal Details components? The Personal Details tile of an HCM Employee Self Service landing page is a link to the employee address component (HR_EE_ADDR_FL). This component (or rather the primary page in the component) uses a two-panel layout to display a list of links on the left and a transaction area on the right. With a little bit of App Designer investigation, we see that the list on the left is really a Derived/Work disconnected Rowset populated through PeopleCode. Therefore, to add a link to the left-hand list, we need to insert rows into that disconnected Rowset. The question is, "How do we add a row to this list without modifying delivered PeopleCode?" The answer: Event Mapping. Related Content Event Mapping is an 8.55 PeopleTools feature that lets a developer map a PeopleCode event handler into a component event. What this means is we can write PeopleCode separate from Oracle's delivered PeopleCode and then map our PeopleCode into the same events already handled by Oracle. Since we are not intermingling our code with Oracle's, this is a configuration, not a customization. Before writing any PeopleCode, I recommend identifying your target event. Your PeopleCode has full access to the component buffer and executes in the same context as the target event handler. If your event handler targets RowInit of level 2, for example, PeopleCode functions such as GetRowset and GetRow will return the level 2 rowset or row respectively. Another reason to identify your target event first is because it is a good idea to have an understanding of the event PeopleCode you will be supplementing. Note: the transfer method described here may not display the usual PeopleSoft warning message regarding unsaved data. A future iteration would leverage the FieldChange event, but not until after Oracle posts a fix for components with subpages. The next step is to define a Related Content Service Definition. 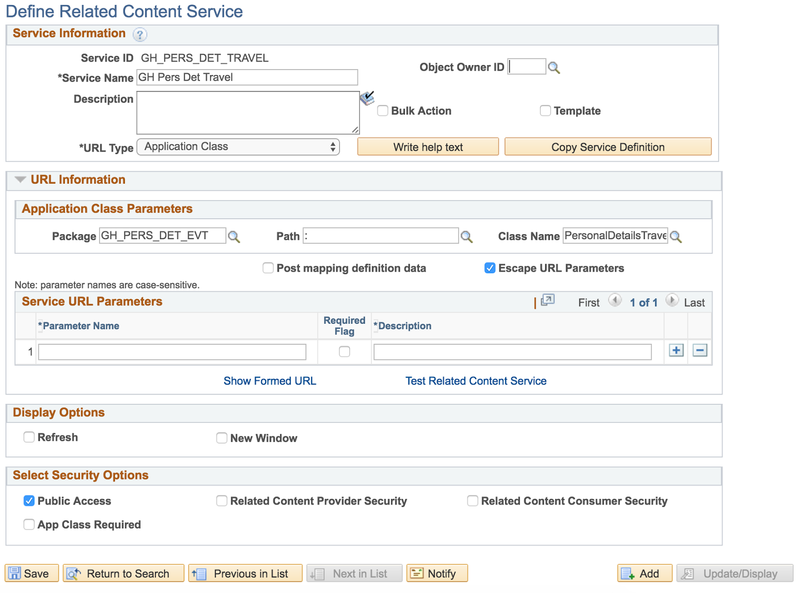 Although not necessarily related, the Related Content Framework contains all of the hooks necessary to implement Event Mapping. 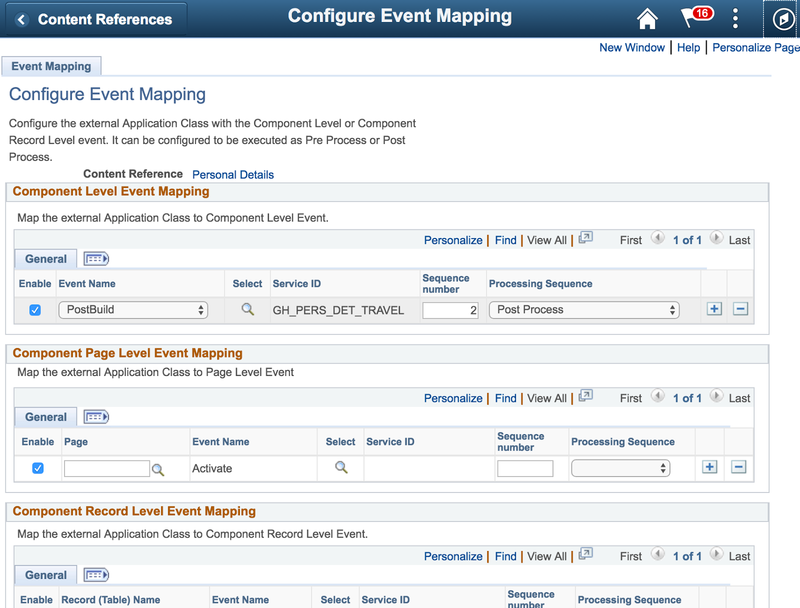 With that in mind, Oracle chose to make Event Mapping a subset of the Related Content Framework. 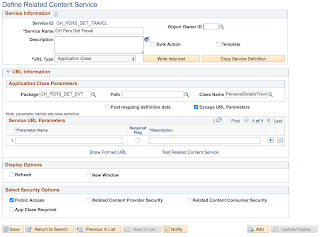 To define a Related Content Service Definition, navigate to PeopleTools > Portal > Related Content Service > Define Related Content Service and add a new value. The ID you choose for your Related Content Service is not important. No one except an administrator will see the ID. Enter a user friendly service name and choose a URL Type of Application Class. It is this one piece of Metadata that will tell the Event Mapping Framework what code to invoke. When the Application Class Parameters group box appears, enter your package, path, and class name. The final step is to map the Service Definition into a component event. Navigate to PeopleTools > Portal > Related Content Service > Manage Related Content Service. When you first land on this page, you may see a list of Content References containing Related Content. Immediately switch to the Event Mapping tab. On this tab, you will see an inappropriately labeled link with the text Map the event of the Application pages. Select this link. 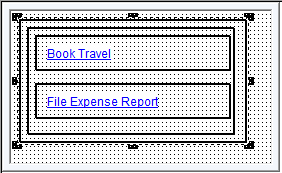 PeopleSoft will respond by displaying the typical enterprise menu in a tree structure. Since we are mapping to a Fluid component, and Fluid components don't exist in the menu, check the Include hidden Crefs checkbox. This will make the Fluid Structure Content item visible. Expand Fluid Structure and Content > Employee Self Service and then select Personal Details. 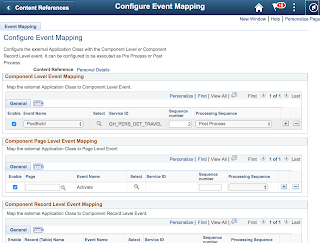 Upon selection, PeopleSoft will present you with the Event Mapping configuration page. Notice that this page is divided into sections, with each section denoting a different definition type. The first group box, for example, is for Component events. Since we are mapping to the Component PostBuild event, it is this first group box we need to configure. From the Event Name drop-down list, select PostBuild. Next, select the service you created in the previous step. Since I created a service named GH_PERS_DET_TRAVEL, that is the Service ID selected in the screenshot below. The final metadata attribute, Processing Sequence, is very important. This attribute defines whether our code should run before or after Oracle's delivered code. In this case we are adding rows to the end of a Rowset and we don't want Oracle to do anything that would change the appearance or behavior of the rows we add. With that in mind, we choose Post Process, which tells the framework to run our code AFTER Oracle's delivered code. Save and test. The above screenshot is from PeopleTools 8.56. Depending on your tools release, your page may appear slightly different. After configuration, you should see a screenshot that resembles the following. Note the Travel Profile link at the bottom of the list. 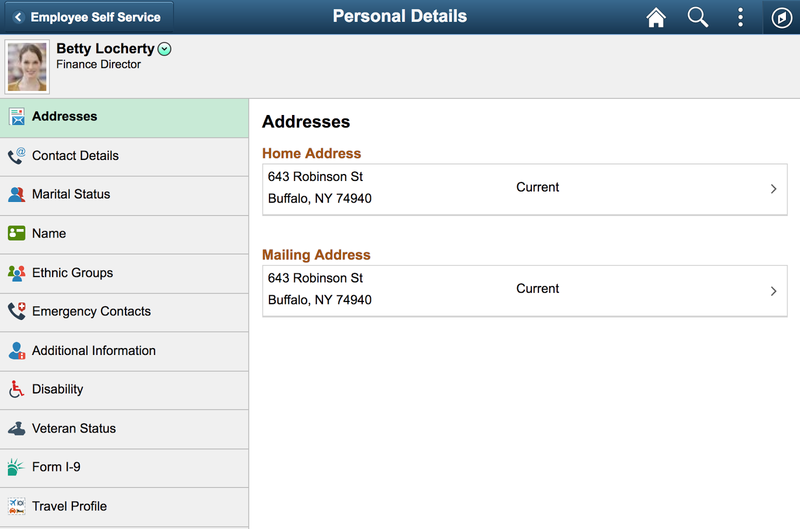 Note: As previously mentioned, the Personal Details component contains links to several other components. To ensure that your component appears in the list on each of these other components, you also have to map your PeopleCode into the PostBuild event on each of those other components. Since these other components do not exist as tiles, you will find them directly in the Fluid Pages folder. Special shout out to my friend Mike at Sandia National Labs, who demonstrated a similar approach at Collaborate 2017. Thank you, Mike, for the encouragement to persevere. I initially wrote the code and configurations for this blog post in December while working with some friends in UK. Unfortunately, due to inconsistencies in PeopleTools at that time, this solution did not work. With PeopleTools 8.55.15 being incredibly stable, this solution is now fully functional. I initially gave up hope for Event Mapping in Fluid. But seeing Mike present the exact same scenario renewed my faith.